The reason for German settlement in Újbarok lies in a project to clear the forests in the region. 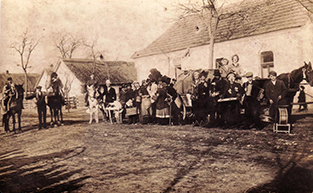 Germans from Felsőgalla and Pilisvörösvár came to the village as workers in the project and many of them stayed afterwards. The settlement only had a small area of fields and therefore agriculture only played a minor role. Most of the inhabitants earned a living in the capital. Young women worked for rich families and the men were either employed in the salami factory Herz or at the Hungarian State Railways. Today the village has approx. 430 residents. The local history museum, initiated by the German self-administration, was founded in 2003. 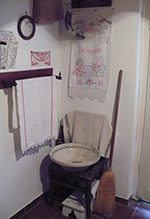 Upon entering the building one immediately stands in a kitchen with historical furniture and basic commodities such as a butter tub, scales, dishes or a mosquito trap. The adjoining room is decorated as a parlour. Typical items such as crusher, spinner’s weasel and spinning wheel point to the spinning of flax. The bed with straw mattress and down duvet and a nightstand with a prayer book can be found in a corner. A cradle, traditional ornamented covers, head scarves and clothes as well as flask for holy water and crucifixes complete the image. The back room is used for the museum’s educational events and as a meeting place. The establishment of Újbarok’s church is a long story: the first church in the village was covered with a thatched roof. In 1801, it was consecrated to the name “Assumption of Mary”. Later, the ground was sold and a new church was built on the main street. In 1877, the new church with its wooden tower was inaugurated and in 1928, a bell of 140kg was added – a present by the married couple Kreidl. Only in 1936, enough money was saved to build a brick tower for the bell. When this was completed, the church was finally consecrated on the 13th of August of the same year. The damage done to the church in World War II could easily be restored. The interior is decorated with frescos of the Virgin Mary and two angels, the miracle of Fatima and the apparition of Lourdes. 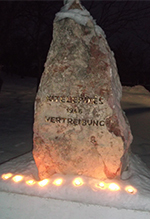 The memorial for the displaced is located in the church garden. 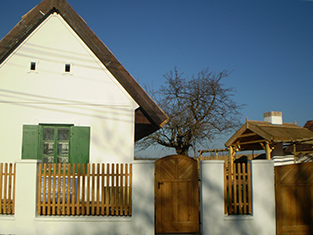 It is the second of its kind in Újbarok; the first was established by the village administration between 1994 and 1998. The wooden sculpture – a dislocated root system symbolising the displaced families – bore the inscription “Those whom God loves will be sent a cross.” The memorial was demolished by time. The memorial was inaugurated in 2009. 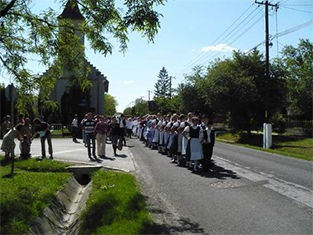 Since then, a memorial service is held twice a year: on May 22th, the day of displacement of Germans from Újbarok, and on January 19th, the official memorial day for the displaced Germans of Hungary. LEFT: The second memorial for the displaced which was consecrated in 2009. RIGHT: Kitchen in the local history museum of Újbarok. The local history museum can be visited during the opening hours of the cultural centre and upon previous notice.